On the eve of the 5th anniversary of DODD FRANK, Congress needs to go dark, go silent, do nothing, no lobbying, no fundraising. Read. Dont rely on staffers. Pull an all nighter, no mics, nothing. Read below. And then read backwards as far as the Buttonwood Tree to understand how in fact Congress pulled a "Hitler", deciding who will not be punished for stealing others entrusted life savings stolen by invoking AWC's, acceptance, waivers and consents along with "without admitting or consenting" while others die alive in jail for lesser crimes that harmed themselves and/or possibly others. Congress created Madoff. Congress wrote the rules. And then wrote more rules, and more and more. And "Orange is Wall Street SRO's New Black." Congress needs to tear the rules down to ground zero and start all over, that is, if both sides of the aisle truly care about Main Street. Otherwise, Congress is compounding more Madoff's license to steal. DODD FRANK says no account can be opened without the person present, that post office boxes are not allowed as addresses and that ID such as a passport and/or drivers license must be presented. What if I can show you that a major wall street brokerage and bank did not follow those requirements. SARBANES OXLEY says the Respondeat Superior is liable for jail if the rules of SOX are not followed. What if I can show you SOX rules are not followed? Lawyers get in the way forgetting that they answer to an ethics. The lawyers ethics are administered by S.R.O's, the wagon the circle to protect their own kinda' guys. One is presuming the lawyer knows their craft, throughly investigated papers, went through discovery or is that kinda guy that bails at the first opportunity for settlement, the kinda guy or gal that jumps in, jumps on, then is off to 'next.' Mothers warn daughters about men like that. Clients assume that a law degree sanctions honesty. Clients find out too late, after, being dragged in to the SRO forum. Can't only blame the lawyers. Each Bar and Ethics Committee interviewed stated they do not require lawyers to write Bar numbers on business cards, in emails and on papers submitted to the Court. The Bar number should be. After all, there is a reason Bar and Ethics Committees have rules lawyers are held accountable to. Shame, few read them as written, rather than seeking loopholes to argue on. Amazing how few legislators actually understand how the forum works. That the SRO holds arbitrations compliant with the FAA, Federal Arbitration Act. That Act is for maritime issues. Consumer arbitrations are to be compliant with the UCC, universal commercial code. Lest we forget, arbitrations are to be conducted by a neutral 3rd party. The SRO that admittedly conducts almost 99% of the Wall Street-Main Street disputes is a business league that Wall Street pays dues to. Accepting dues from Wall Street, disqualifies the SRO from accepting Main Street complaints. Amazing how no one has copped to that before now. Amazing how no one has talked about Madoff and his crimes, pre-2009. Not the US Attorneys that Congress said has oversight of Wall Street crimes. Least of all the SRO, FINRA, that has oversight of Madoff. Hmmm, scratch that. Make that a maybe. By holding the corporate persona of both a Brokerage and Investment Advisor, firms were able to pull complaints in to the SRO DRS, with the client being none the wise. Dont even get started on the suckabees that feed off investor pain, the lawyers. Amazing how books are written by former US attorneys, city defenders etc that state that they can argue SRO cases in states they are not licensed in. Cant complain. They either threaten to sue the client already traumatized by the Wall Street insider and by the SRO process. The states are of no help. The state Bars dont have their act together on this one either. Random poll to pull- ask how many ever even heard of the SRO holding DRS in their city. AND then ask what happens if that foreign stated lawyer is reported to that Bar of the City the DRS was held in. Nothing happens. That Bar will tell the person that local Bar does not have oversight over lawyers not licensed by them EVEN if that foreign state lawyer is technically practicing law without a license, in that local city. Dare not tell that foreign lawyer's Bar association in that discretion of what is confidential, protecting the complainant, changes depending upon who does phone intake and who does the letter intake. The complained about lawyer then, can/will, make a call to someone who makes a call, cagey to keep contact distant and not in writing. There is always a paper trail that can be built. But why would a client complain, even in the case of the customer whose representing counsel cashed the DRS refund check for an arbitration or mediation that may have settled. The judge themselves admit to being overwhelmed and under educated as to the specificities of documents put before them. Judges look at case law and case precedence. Unfortunately, this a a bugaboo in the realm of Wall Street v Main Street. There is Federal law case precedence of cases like Madoff who turned himself in. Federal decisions are Counts for each crime committed. This Federal application may not necessarily have the local law component and for the time period in question another problem for law enforcement looking to do what they do best, protect the beats they walk from the Beasts Of Wall Street that prey. So below it is shown that Bernard Madoff told the truth, that "THEY KNEW." "They" did. 50 years ago "THEY KNEW" that Madoff was selling no product. But Congress wrote the rules that led Madoff continue to rob investment clients for 5+ decades along with the rules that put Eric Garner behind bars 11 times. What to do? Well, the law does accommodate for that on local, state and Federal platforms- accessory to crimes, before, during and after the fact. Judges, lawyers, regulators and SROs are not above the law, a gift to maybe every trusting investment client led in to a FINRA forum that worked out badly for the investor. Congress wrote the law that says the SRO is advocating in issues of Broker and Brokerage. Broker and Brokerage. Broker and Brokerage. The Investment Act of 1935 is very clear 'what to do' when the rules Congress wrote for the SEC, Securities and Exchange Commission, to follow are violated. Madoff was to be reported to the US Attorneys FIFTY YEARS AGO. No one told the US Attorneys. No understanding why Madoff was not to be reported to local police. Ahhh, yes. Corrected, someone did tell the US Attorneys. Madoff did, himself. A few months after the SRO that the SEC appointed sanctioned Madoff for $25,000. The SRO, Self Regulatory organization came intervened to keep the investment client complaints away from law enforcement, bringing the complaint Sanctions against Madoff's firm, not against Bernie and Peter, who owned the firm, as screengrabbed below. No need to report a complaint if the cops didn't press charges. No charges to press if no one signs a complaint, having been deterred to FINRA Dispute Resolution where confidentiality agreements are signed when a complaint is brought in and expungement agreements are signed if a client wants to collect an award if an award is determined. The SRO wrote, "... you seem to think that FINRA’s By-Law, Article VI, Section 3, exempts you from any legal obligation to pay the arbitration award at issue because it contain an exception for “valid basis for non-payment.” The By-Law in question permits FINRA to suspend the licenses of firms and associated persons who fail to pay an arbitration award, unless they present a valid reason for not paying the award. The By-Law does not apply to you because you are not a firm or associated person subject to FINRA’s regulatory jurisdiction. 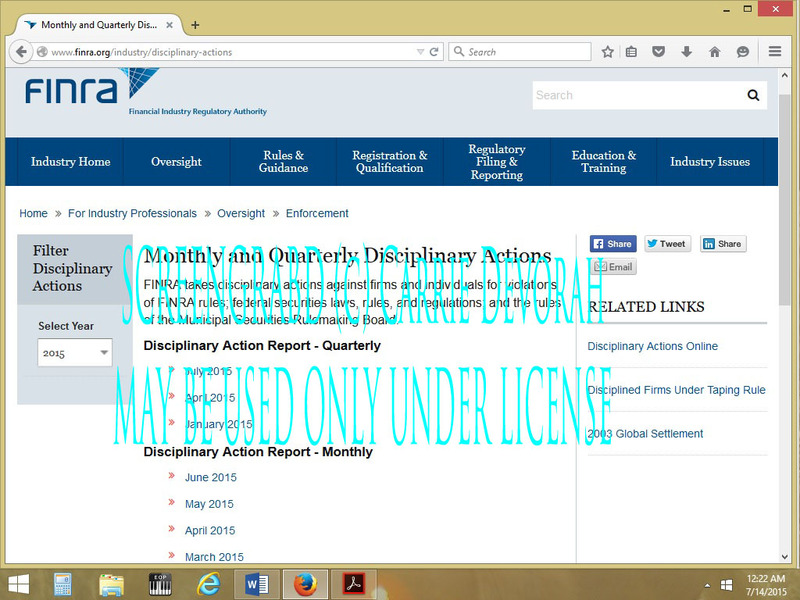 You do not hold a securities license that FINRA could suspend." Dispute resolutions are supposed to be neutral with the law applied equally. With all of the speculation over the years, by investment clients, there is no more quesswork. The SRO arbitrations and mediations are not just. Decisions rendered by the SRO should be repealed, no less, than as far back as 2007 when it underwent its name change from NYSE & NASD to FINRA. Congress let this fraud happen with rules Congress wrote, rewrote time and again. What if I can show you that a major foreign back registered with the SEC did not follow SOX, moreso that the President testified in Congress on Investor protection but did not disclose to Congress that 11 months earlier a nationwide multi state investigation was initiated in to their firm. What if I also told you that neither the regulators nor the entity itself told investors that the investigation started in 2008 or was concluded during 2013-14 for the actions of the CA’s and RR. STILL. What if I told you there is a practice of Financial Consultants to keep closed accounts open and use those "dead" accounts for fiduciary abuse? That the SRO expunges crimes without reporting them to police while men like Eric Garner known to police. He was fingerprinted and mugshot and served time. If I could document all this, what would you do, would you agree the problem starts with Congress and the SEC ACT of 1935 and 1940, and that Congress created the Wall Street That Broke Main Street? [ FINRA ] (December 1997) [Ronald Howard Tjarks (Registered Representative, Hastings, Nebraska) was fined $340,000 and barred from association with any NASD member in any capacity. The sanctions were based on findings that Tjarks affixed a customer’s signature on annuity withdrawal forms and withdrawal checks totaling $94,000 without the knowledge or consent of the customer. In addition, Tjarks deposited withdrawal checks totaling $54,000 into his personal bank account and converted the funds to his own use and benefit without the knowledge or consent of the customers. Tjarks also failed to respond to NASD requests for information. 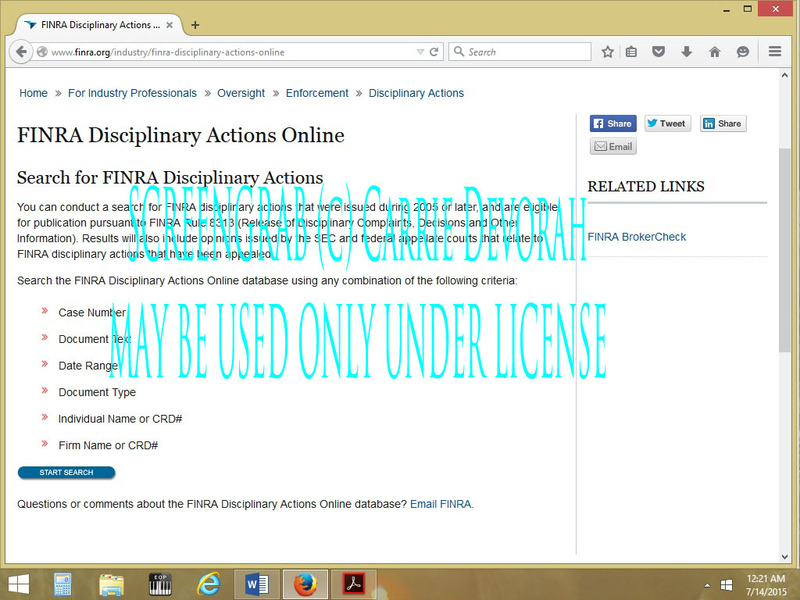 [ FINRA ] (September 2004) (NASD Case #C07040037) Diane Kathryn Byrd (CRD #4078944, Registered Representative, Rapid City, South Dakota) submitted a Letter of Acceptance, Waiver, and Consent in which she was barred from association with any NASD member in any capacity.